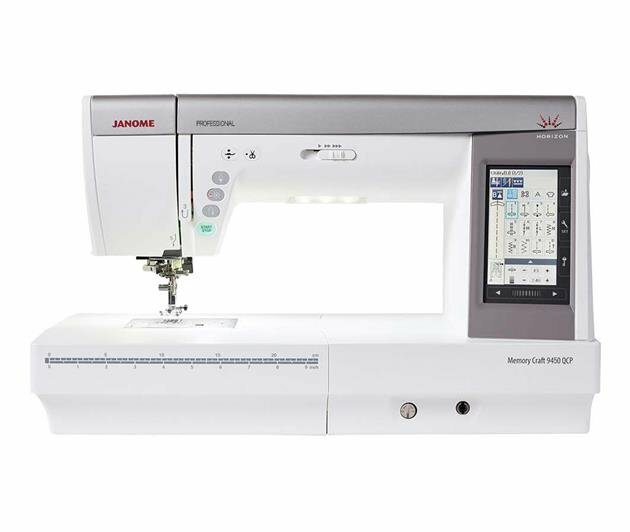 The Janome MC9450QPC has all the features to simply sit, relax and sew. The large LCD color touch screen makes it easy to navigate through the 350 built-in stitches, including 11 one-step buttonholes and 7 alphanumeric fonts (with 9mm lettering & numbers). You can customize each stitch and save favorite stitches. The sewing applications section gives you a variety of pre-set stitch functions, ready to sew zips, blind hem, buttons, quilting, patchwork and lots more. Quilters will appreciate the AcuFeed Flex Layered Fabric Feeding System, the automatic presser foot lift and the electronic automatic tension control. The MC9450 offers you extensive lighting with 9 white LED lights including a high light which extends out and illuminates the needle area.